Small geosynchronous earth orbit (GEO) communications satellite manufacturer Astranis announced this week it has landed its first customer. Pacific Dataport, a group backed by Microcom and others, is purchasing the first Astranis satellite and dedicating for providing broadband to Alaska. Target launch for the Astranis launch is by the second half of 2020. The Astranis MicroGEO satellite will provide 7.5 Gbps of capacity, roughly tripling the currently availability satellite capacity in Alaska and is expected to bring costs down by “an average of three times less” than current pricing for both residential and wholesale customers, according to a company press release. 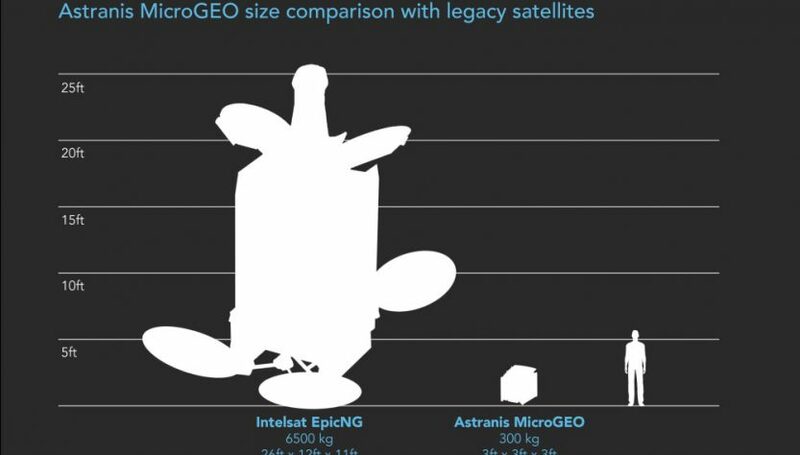 At roughly 3 feet a side, the Astranis MicroGEO satellite is a bit bigger than the “dorm fridge” imaging satellite form factor, but is nothing compared to traditional van and bus-sized GEO comm satellites costing hundreds of millions of dollars to build and more hundreds of millions of dollars to put into orbit. A couple of Astranis MicroGEO satellites could be packed on a SpaceX Falcon 9 and launched directly into geosynchronous orbit. Broadband satellite services in Alaska are challenging for a number of reasons. Due to its population size and location, traditional communications satellite operators view the area as an afterthought when compared to the rest of the United States, so there are few transponders or directed spot beams dedicated to the area. Due to its higher latitude relative to the equator where GEO comm satellites are parked, users on the ground need bigger dishes than someone located in the continental U.S.
Longer term, Pacific Dataport wants to provide between 40 to 50 Gbps of dedicated bandwidth to the state of Alaska with its planned Aurora satellite system. Around 39 percent of Alaskans are underserved when it comes to internet access, according the Broadband Now website, with only 4.9 percent having access to fiber optic service. Astranis is one of several companies getting into the small GEO comsat market while manufacturers of large communications satellites have seen the market for their spacecraft shrink significantly, from 20 or more orders per year down to 7 or 8 per year in 2018. Dwindling orders have lead to Maxar to pivot to building smaller satellites as SpaceX, Telesat, OneWeb, and LeoSat plan to build large low earth orbit (LEO) constellations to provide fiber-like data links.